Lafayette City Hall is located at 20 North Sixth Street, Lafayette IN 47901; phone: 765-807-1021. Photo: William Potter House, 915 Columbia Street, Lafayette, IN. Listed on the National Register of Historic Places in 1983. Photographed by User:Nyttend (own work), 2009, [cc0-by-1.0 (creativecommons.org/publicdomain/zero/1.0/deed.en], via Wikimedia Commons, accessed August, 2014. The Main Street Historic District developed as Lafayette's business district expanded east beyond the Courthouse Square. Sixth Street, which is the district's western boundary, was Lafayette's eastern edge when the city was originally platted. By the early 1840s, the boundary had been extended to include all of the district. Beyond the former Lake Erie and Wabash Railroad which formed the district's eastern boundary, Main Street takes on a more residential character. Many of the district's buildings including several fine examples of Italianate commercial architecture were constructed in the 1870s and 1880s. Also included are early twentieth-century buildings in the Neoclassical and Art Deco styles. Together the buildings form a continuous and cohesive streetscape leading into Lafayette's downtown commercial area. The Enterprise Hotel at 1015 Main Street has served as a hotel or restaurant under various names such as the Alt Heidelberg, American Lafayette and Derby Hotel since 1899. It was listed in the National Register of Historic Places in 1984. The Italianate Homey and Wright Building, built c.1870, housed the company's typewriter ribbon and carbon paper supply business in the early 1900s. It later had a colorful history as the Oak Tavern Speakeasy and Gambling House during the prohibition years. Other Italianate commercial buildings include the Vollmer-Conrad Building, the Bower Building (32049) and the Beck Building, all constructed during the 1870s. The Painters and Decorators Building, built in 1923 in the Renaissance Revival style, exhibits fine craftsmanship in its terra cotta facade. 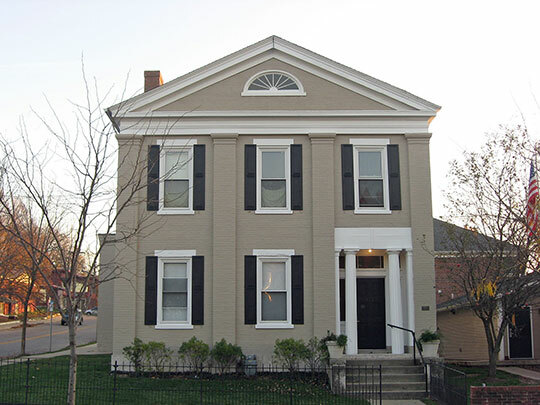 The D. L. Ross Building and the Weigle Townhouse were constructed in the Neoclassical style. The area provided entertainment for the community at the Lafayette and Mars Theaters. The Mars Theater, designed in 1920-1921 by prominent local architect Walter Scholer, Sr., is the oldest theater in Lafayette. It was placed in the National Register of Historic Places in 1981. Today, it serves the community as the Long Center for the Performing Arts. The Lafayette Theater, a noteworthy example of the Art Deco style, was completed in 1938. Today the area remains as a vibrant commercial district in Lafayette's downtown. Indiana Historic Sites and Structures Inventory, Tippecanoe County Interim Report, Historic Landmarks Foundation of Indiana, Indianapolis, 1990.